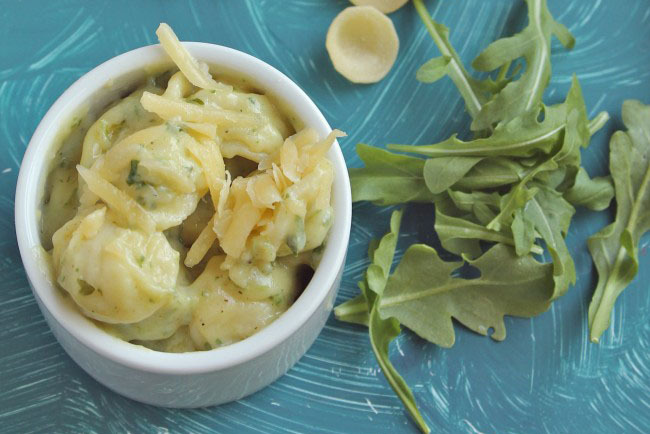 A simple avocado mac and cheese recipe with creamy avocado white cheddar sauce. Ready in 30 minutes. Vegetarian. This post contains affiliate links, which means if you purchase something I’ll earn a small commission at no cost to you. Like this recipe? 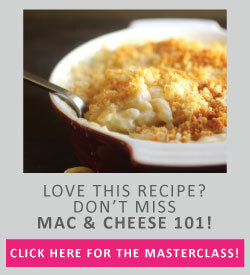 Don’t miss Mac and Cheese 101! It’s Day #2 of MAC AND CHEESE WEEK (aka the best idea I’ve ever had in the history of ever). 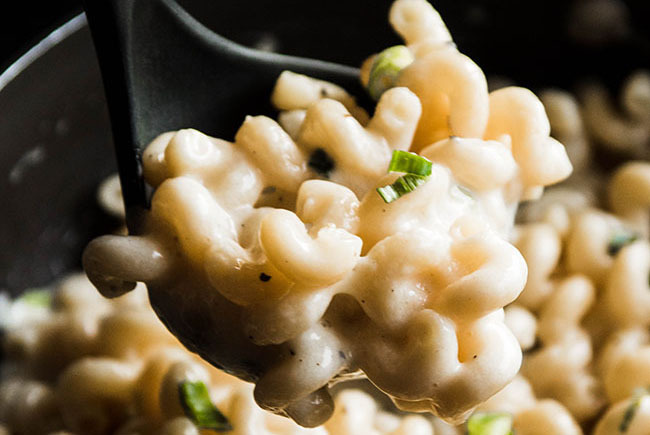 Today, it’s white cheddar avocado mac and cheese for the win! And BAM! 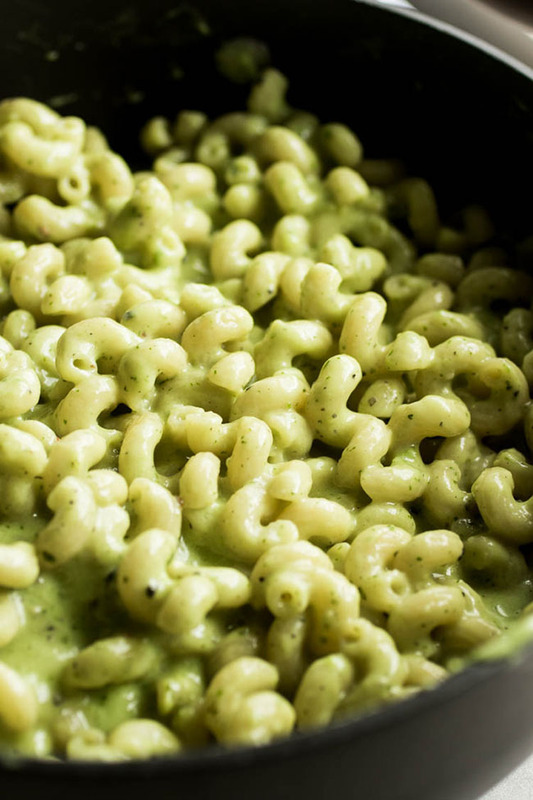 Creamy, colorful avocado mac and cheese at your service. 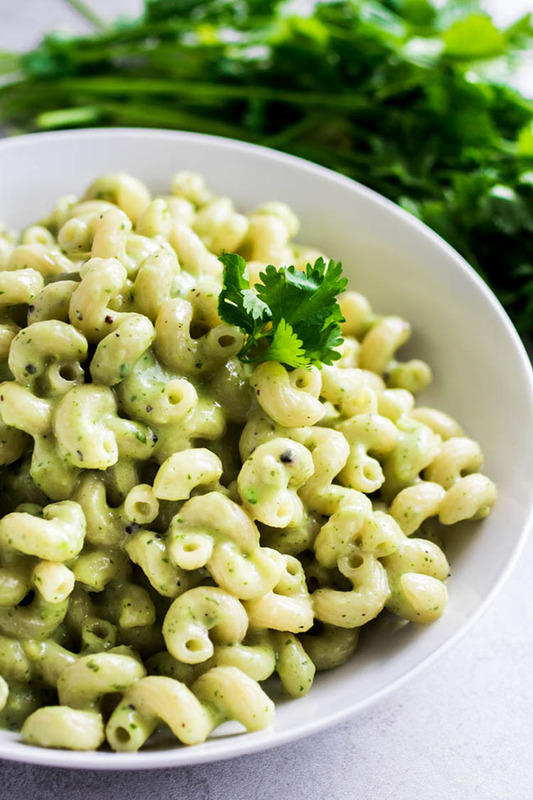 The creamy avocado pasta sauce we’re using here means there’s a little less milk and cheese than usual in this mac and cheese recipe, which is perfect if you’re trying to eat less dairy (or, y’know, just eat MORE avocados). 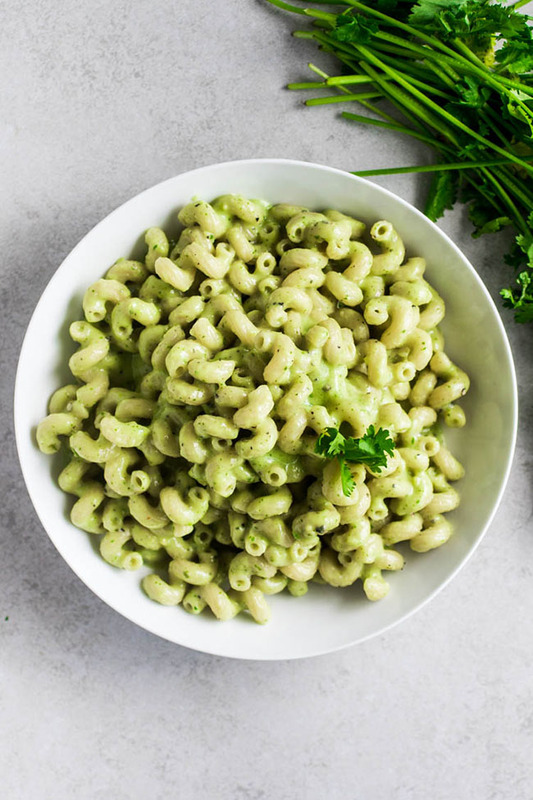 The result is an ultra-creamy, slightly green-tinted (but, like, in a GOOD way) mac and cheese that’s sure to be a hit. I love the mellow flavor of the white cheddar in this recipe highlights the delicate, buttery avocado, but you could use just about any cheese you like here. Pepper jack is a good choice for an extra kick, or you could sub in some gruyere, goat cheese, cream cheese, or parmesan to mix it up a bit. Add some shredded chicken for extra protein or toss in any veggies you have on hand to make this a little heartier – this is a great “blank canvas” recipe to get you started! Don’t forget to check out the rest of our macaroni and cheese week lineup below, and be sure to stop by Mac and Cheese 101! 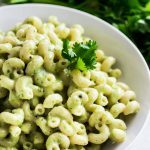 Easy, creamy avocado mac and cheese with a simple white cheddar avocado pasta sauce. Cook pasta according to recipe or package directions until al dente (I always cook pasta in very salty water – it brings out the flavor of the pasta). 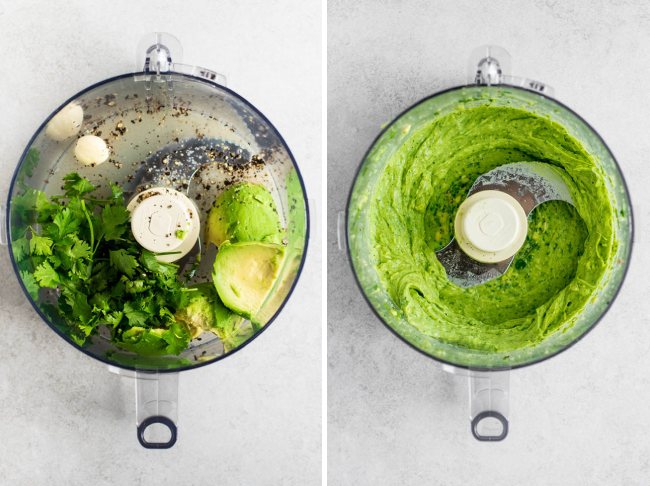 Combine all avocado sauce ingredients in a food processor or blender. Pulse to break up the ingredients, then use a spatula to scrape down the sides of the bowl and pulse again until you have a thick, creamy sauce. Set aside. In a large saucepan, melt butter over medium-high heat. Whisk flour into the butter to form a roux and cook for 1 minute. Whisk milk into roux a little at a time until you’ve worked out all the lumps. Bring sauce to a simmer and cook, stirring frequently, until mixture has thickened, about 6-8 minutes. Whisk avocado sauce into milk mixture. Cook for another 2-3 minutes, until sauce has thickened again. Remove sauce from heat. Stir in white cheddar cheese, salt, and pepper. Mix until cheese has melted. Add pasta to sauce and toss until pasta is evenly coated. 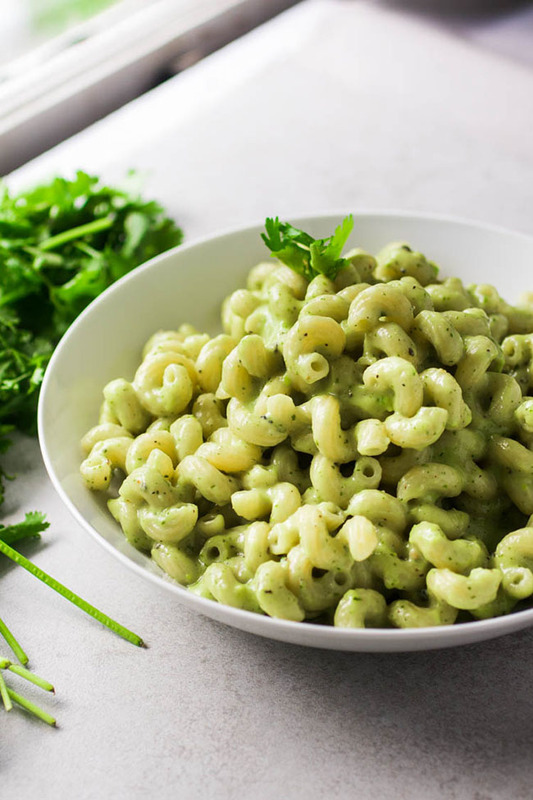 Top mac and cheese with fresh cilantro (optional) and serve immediately. If you have an especially large food processor, you may have to scrape down the sides a few times or add an extra bit of lime juice to help the blades bring the mixture together more quickly. Use extra shredded cheddar cheese if you like! Add any protein or veggies you have on hand to make this a heartier meal. Mix up the cheeses if you like – pepper jack, goat cheese, gruyere, and parmesan are all tasty additions to this recipe. 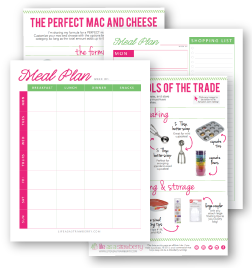 This recipe was recently updated to include new photos and more streamlined instructions. 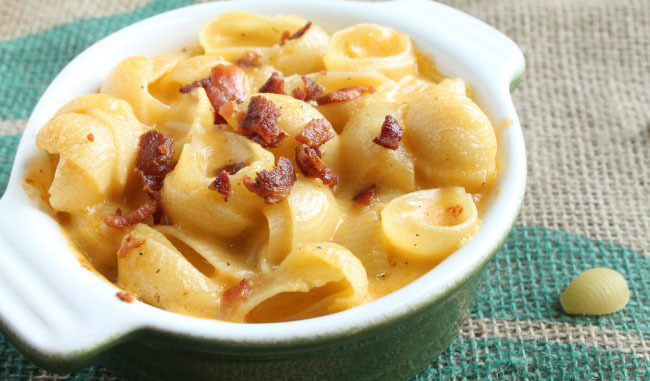 DON’T MISS THE REST OF THESE MACARONI AND CHEESE WEEK RECIPES! 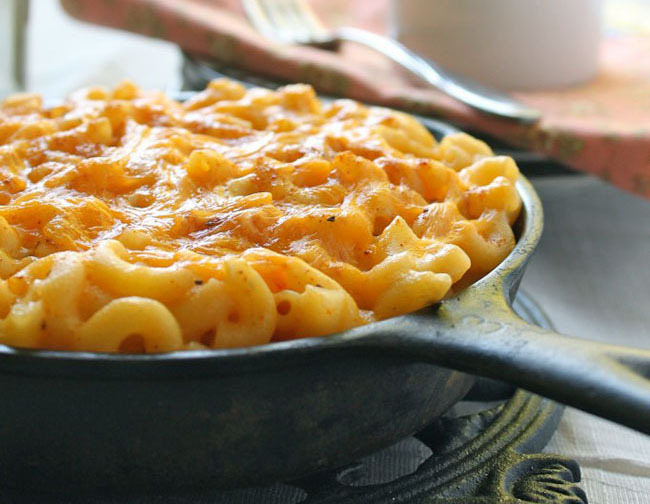 Hard Apple Cider Mac and Cheese. With Bacon. This is so tasty! I mixed some cotija cheese in right before serving, that’s the only thing I changed. Definitely going to keep this recipe in mind when avocados are plentiful! I’ve made this twice now and it’s so delicious! Seems to go over very well every time. I absolutely love your site (and your enthusiasm for cheese). Thanks so much! I’m so glad you like it! Thanks! So you don’t bake this mac & cheese at all? I didn’t bake it for this recipe, but you absolutely could if you’re craving a crunchy mac-and-cheese crust! I’m usually too lazy to wait for my mac and cheese to bake, so I eat it right away 🙂 If you want to bake it, I’d add a little bit more milk to the sauce (it will reduce in the oven) and undercook the pasta by two minutes, then top with herbs and bread crumbs (or more cheese, up to you)!